Its that time of year again! I thought I would re post this fun DIY Viv and Edward costume from a couple years ago. Click here! DIY PRETTY WOMAN VIV & EDWARD COSTUME! It's that time of year again!! I thought I would re post this in case you guys are looking for a last minute costume idea! We had Scott Clifton's 30th birthday party thrown by his beautiful wife Nikki last night. We have been so busy that we had no time to get a costume! At the last minute, We decided to be Vivian & Edward from one of my favorite movies, Pretty Woman (and by last minute I mean at 2 pm when the party was at 830) We ran out to get the essentials (wig, hair color, accessories etc) I already had the thigh high boots from when I used to take S Factor classes with Sheila Kelley. Darin obviously had the suit and tie and just needed to accessorize. The accessories were easy to find, the problem was finding the famous outfit Julia Roberts wore in the film. You can order it online, but clearly that wasn't an option. So we made it ourselves!!! Here is what you need..
Scissors * try to use fabric scissors, you will see why! A sewing kit or safety pins. Silver spray in hair color. 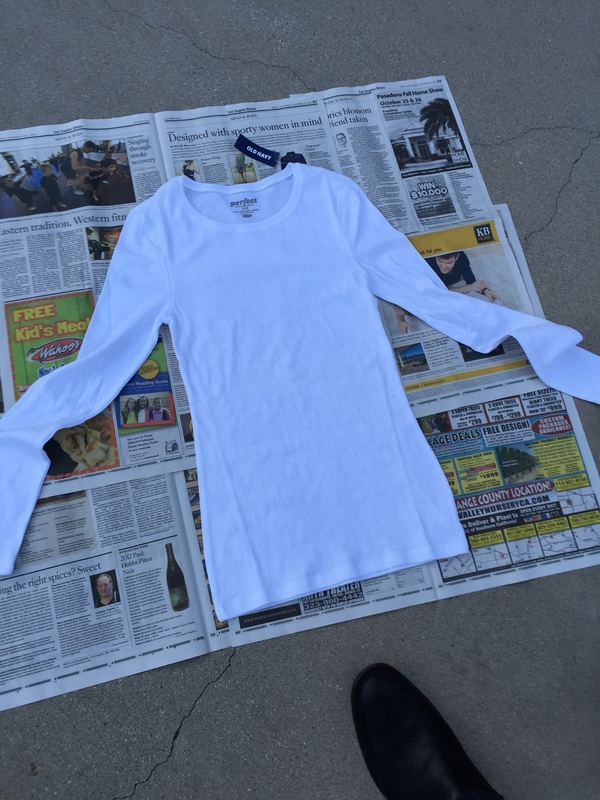 Take the plain white T-shirt outside (we could only find long sleeved so we cut the sleeves off) lay it flat and using the blue spray paint, spray in horizontal lines like this on both sides. Then take your black paint and do the same. Once both sides are done, let it dry a few minute. Then take your scissors and cut out the arm pits in half moon shape leaving some material at the top to attach to the ring. This is why fabric scissors are important!! It was hard to cut straight but when it was on, you couldn't tell. Do the same with the tank top leaving the bottom longer to wrap. 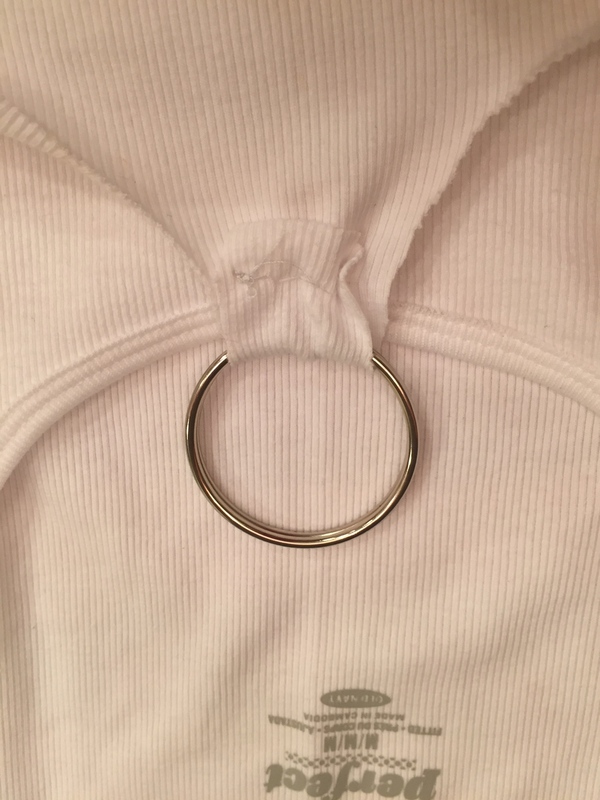 Sew or pin the pieces around the ring. Smokey eye and a red lip! one of my favorite looks! The rest of my face was my usual, if you follow my blog then you know! Have fun!!! If you decide to do this look, send me pics! !